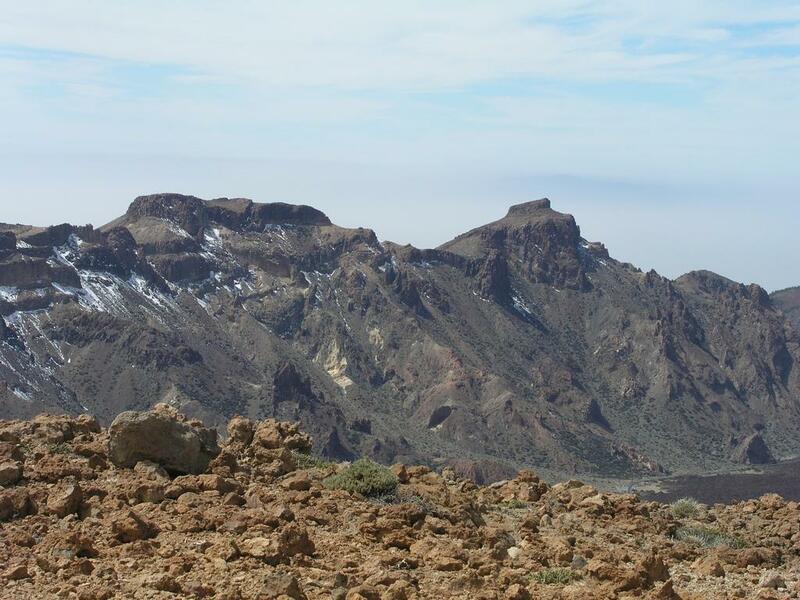 On Tenrife, opposite of El Teide. Saddle: North of the mountain, the 2200 meter contours turns back, while the 2210 contour goes through. 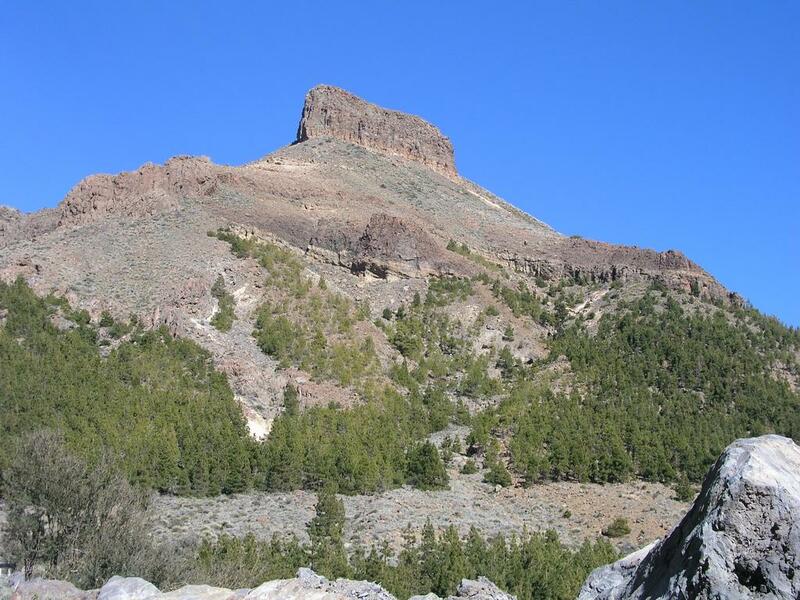 How to get there: The trailhead is about 3 km south of the mountain Pico del Teide. 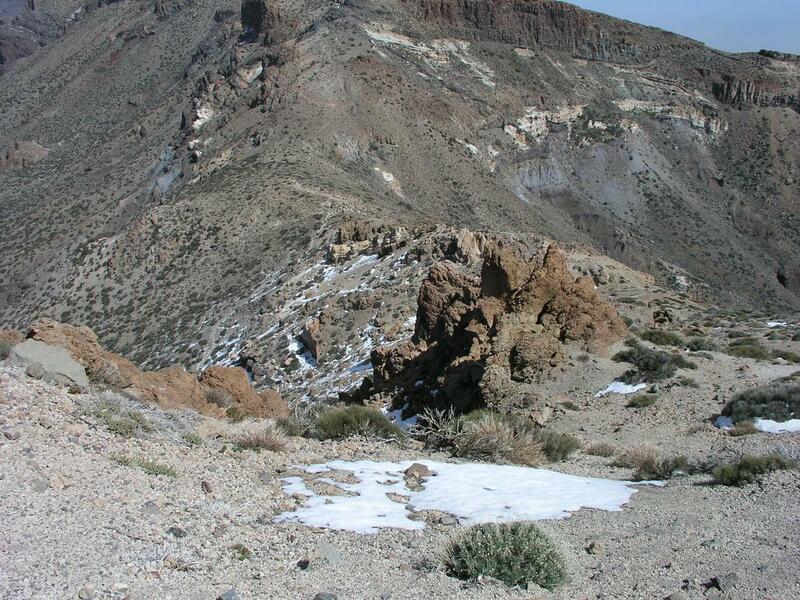 For general information, see the information under Pico del Teide. More precisely, the trailhead for Montana de Guajara is between kilometer marker 47 and 46, south of the tourist facilities at Parador. About 250 meter north of marker 47, a smaller road goes straight east for about 800 meter. The road continues, but is closed to traffic. This is the trailhead and there is reasonable space for parking. The trailhead location is north 28:13.262, west 016:37.296, elevation 2150 meter. Alternatively, one may park at Parador (a bit further north on the main Hwy.) and hike a short trail south to the trailhead. Route description: There are two routes, a (YDS) class 1 easy and well developed trail that ascends the mountain via its east ridge and a steeper and more direct (YDS) class 2 trail that climbs the peak on its NW face. On this picture, the two routes are shown. The direct route: This route starts out from the parking area, or even a little bit before you arrive at the very end of the road. When facing the mountain, there is a distinct knoll with elevation 2235 meter, slightly to your right. The initial part of the route ascends the slope on the left of this knoll. Just before getting to the saddle, the trail turns sharply left and continues uphill. Higher up, there is a rockband. The trail makes an ascending traverse to the right just below these rocks. 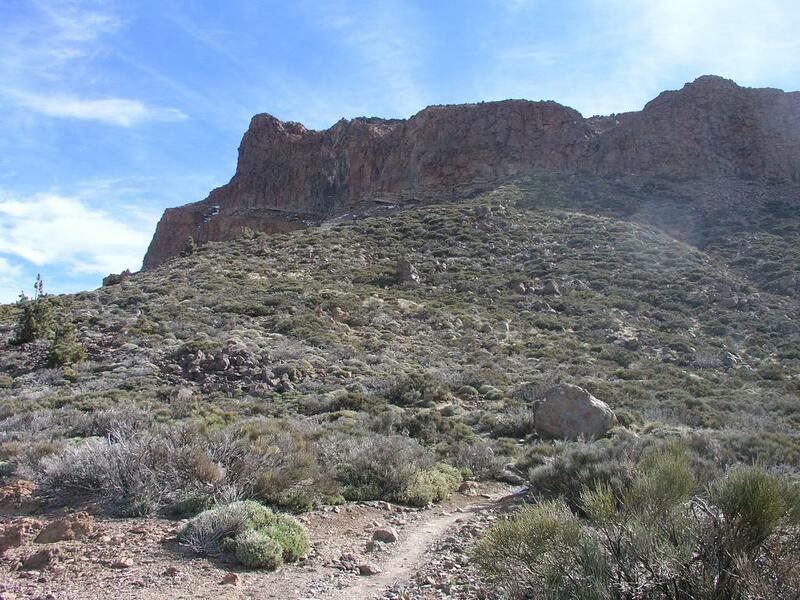 Gaining the rim ridge, there is a small downhill to the saddle before the final slopes of Guajara. Continue uphill, the trail is marked by cairns and green, painted dots. A somewhat more distinct ridge is followed uphill until the trail leaves the ridge and traverses left. Further up, the route is now entering a shelf. Initially, this shelf is quite narrow, only one meter at the most narrow spot. The exposure at this point is significant. Further onwards, the ramp is again somewhat wider, but sloping outward and more hard snow may prevail here (due to the north facing slope). Finally, the upper and very last part of the ramp ascends in an elegant right turn to gain the summit plateau. With summer conditions, this route is (YDS) class 2. 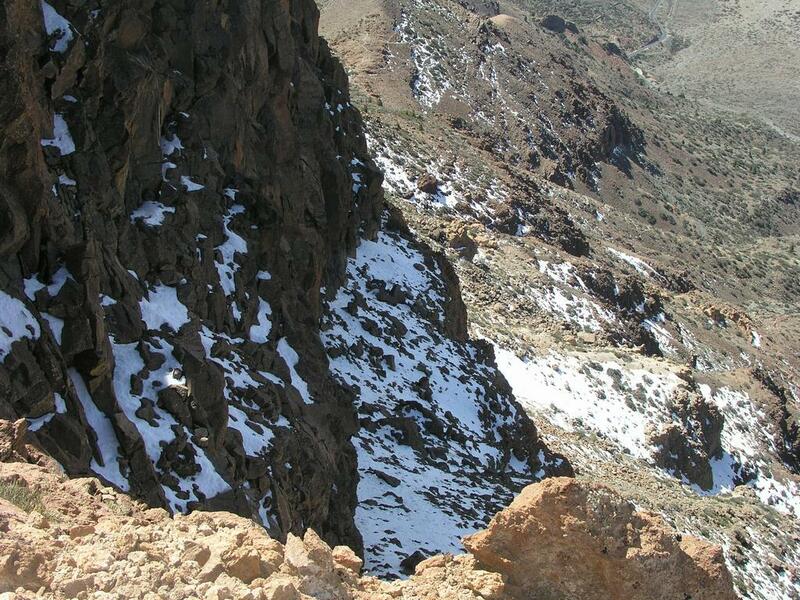 During winter, this route would normally require crampons and an ice axe for safety. 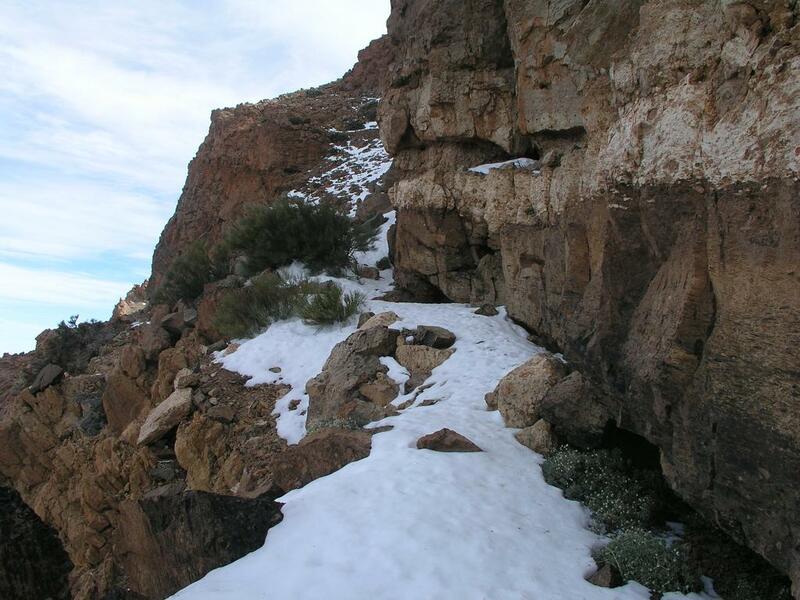 The significant exposure and the icy, hard snow combine to turn an easy summer route into a route that demands proper equipment and experience in winter conditions. The east ridge route: This route starts out along the road, pass the locked gate and walk by some interesting rock formations on your right. A bit further along, the road makes a big U-turn to the left in order to gain the ridge in front. A cairn indicates a path to the right up the small gully reconnecting with the road higher up. 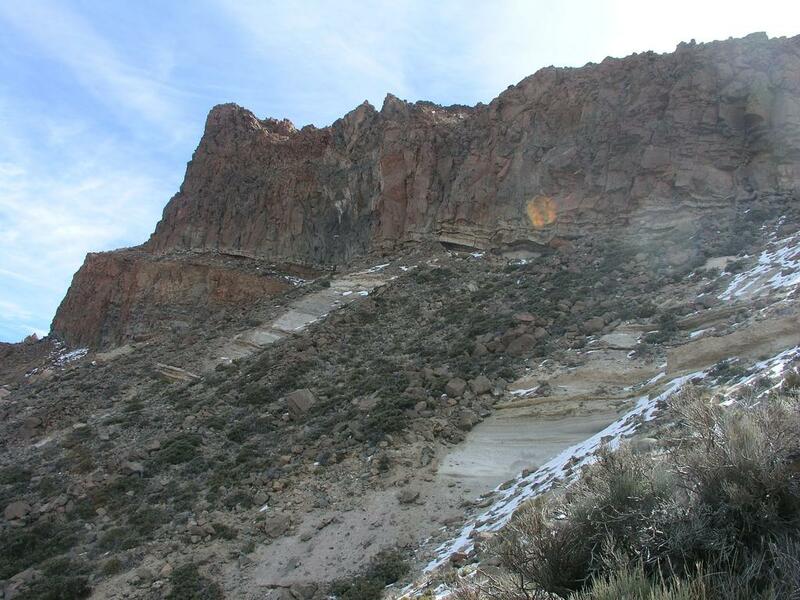 Continue along the road, below some cliffs, before descending gently into a more level area below the crater rim. The peaks Montana Pasajiron, Roque de la Grieta, and Topo de la Grieta continues the caledra rim to the north-east. Two big cairns on the right side of the road signal the beginning of the trail that climbs to the saddle between Montana Pasajiron and Montana Guajara. 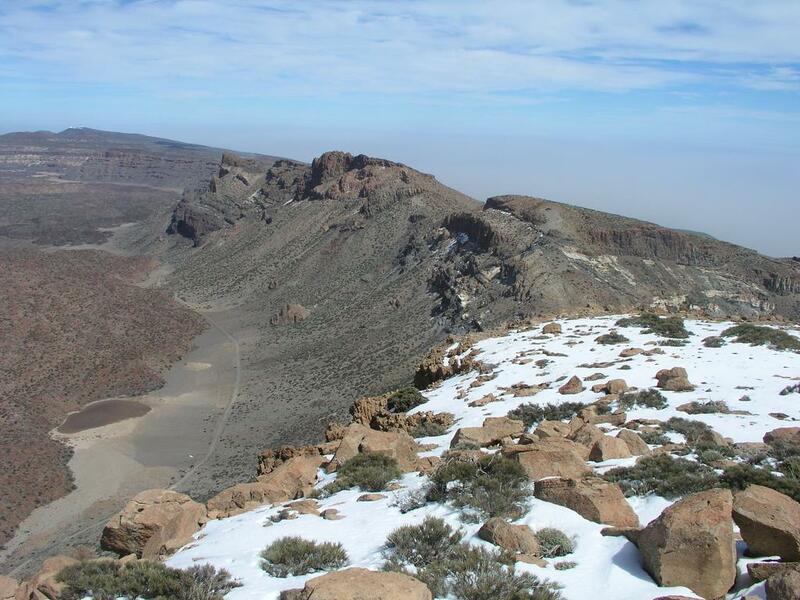 The saddle is at north 28:13.152, west 016:35.894, elevation 2371 meter. From this saddle, the trail heads right towards Guajara. 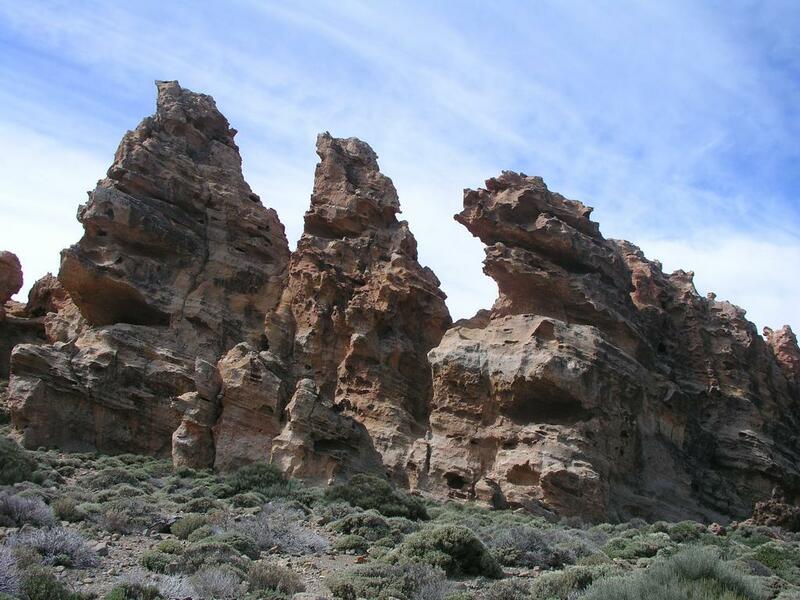 First, among some interesting formations reaching a local hilltop before a short descent along the ridge. Next, the trail climbs more steadily before a more level section near the summit. 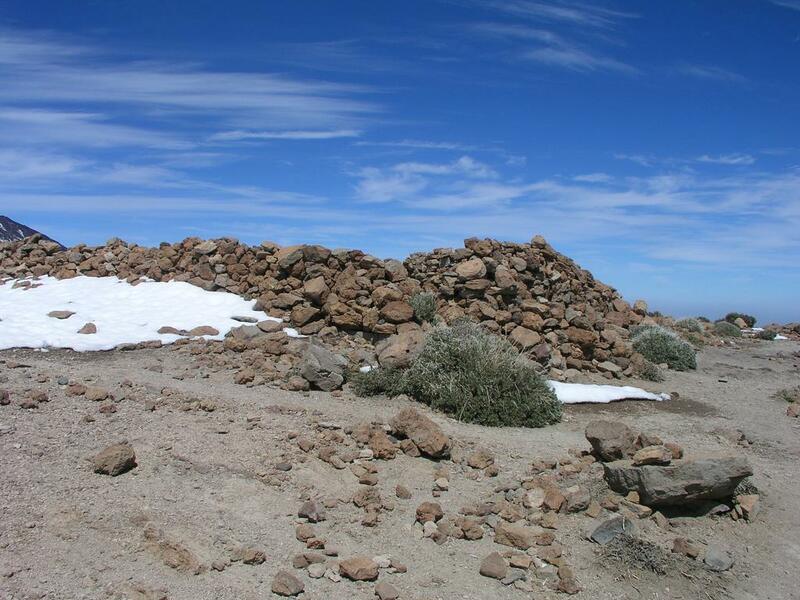 The summit plateau is quite large, there is a pretty large rock shelter (only low walls) complete with a small rock table at the summit. Continue the rim traverse: Climb on to Montana Pasajiron. Comments: I started about 1015 and headed straight up the direct route on the NW face. Two days earlier, Pål Jørgen had pointed out a possible route along a shelf that seemed to connect to the summit. As we later found out, there is actually a marked route that runs precisely there. The amount of snow on this north facing slope and how hard it is determines the feasability of the route in winter. The first part looked quite promising, the snow was (too) hard, but there seemed to be a way to avoid it. 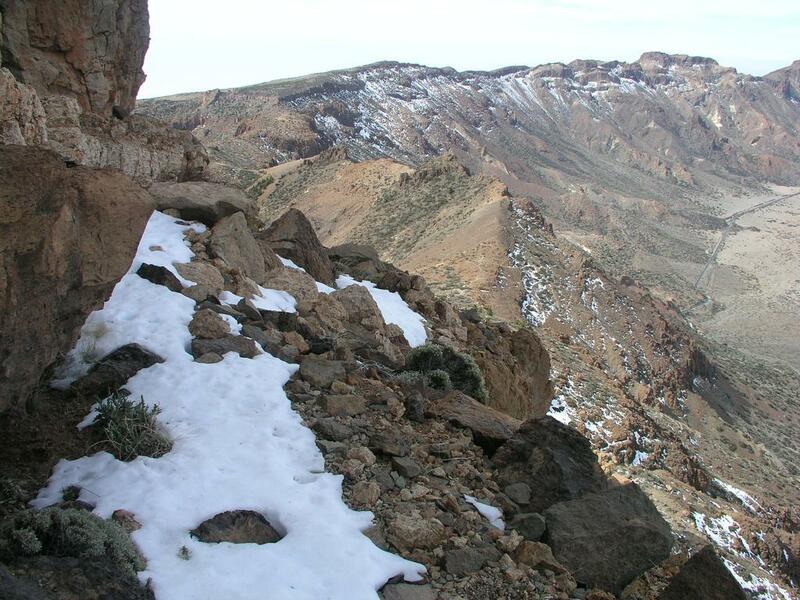 However, after gaining about 500 vertical meter, the conditions became difficult and unsafe without crampons. The decision to turn was quite easy. It took me one hour to the most narrow section of the route, then 45 minutes to return to the trailhead. I continued straight for the east ridge route and arrived at the summit 90 minutes after leaving the trailhead. Lunch was overdue and I spent 45 minutes enjoying the scenery and the good weather. 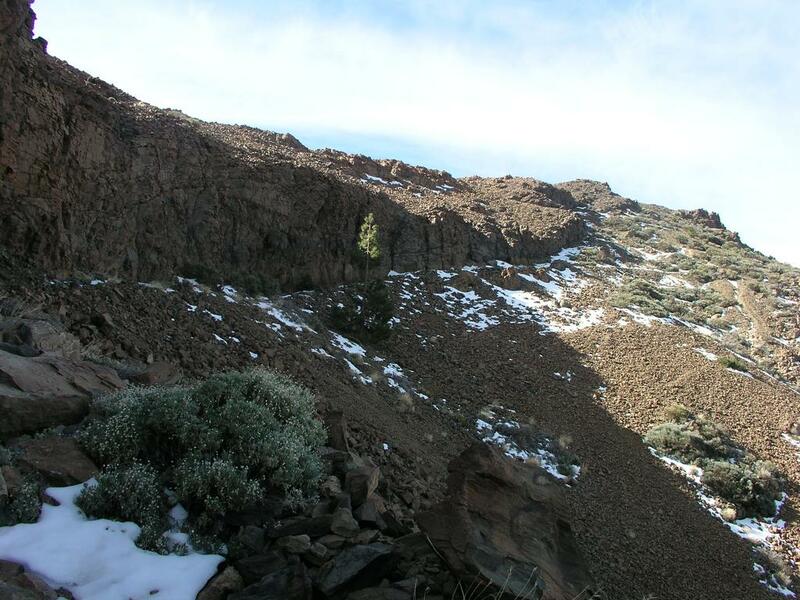 The rim continues to the west with two distinct peaks, Roque de los Almendros, 2523 m and El Sombrero 2531 m. I had noticed El Sombrero from the opposite side when we returned from the Teide climb. It would be interesting to know the easiest route on this fine peak. The day was just too nice for a quick return, so I decided to traverse the rim all the way to Topo de la Grieta. Including short stops, some route finding and the 4 kilometer return hike on the road, this took another 3.5 hours. 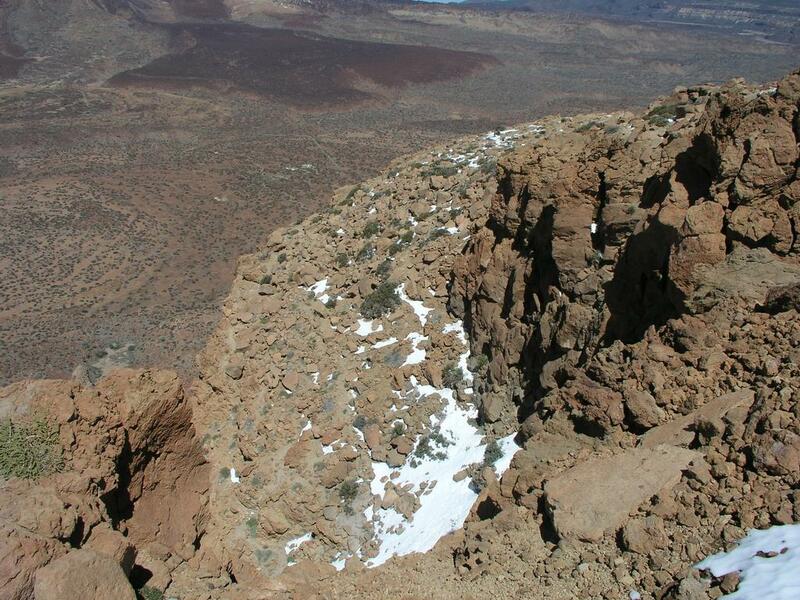 The traverse has a total vertical gain of about 1100 meter, with my aborted direct route on Guajara, 1600 meter. It was nice to arrive back at the car at 1745 after almost 7.5 hours in the mountains. 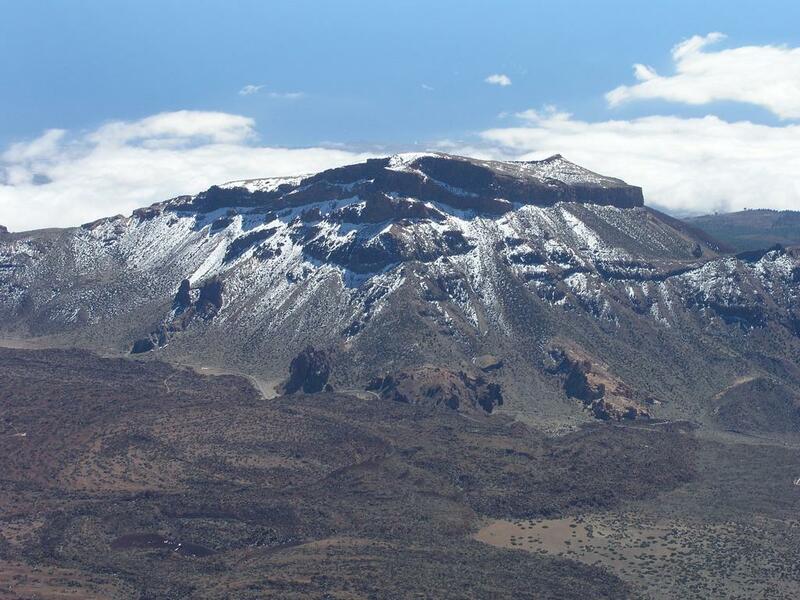 Montana de Guajara, as seen from Pico del Teide. High on the direct route, descending after turning due to unsafe conditions. 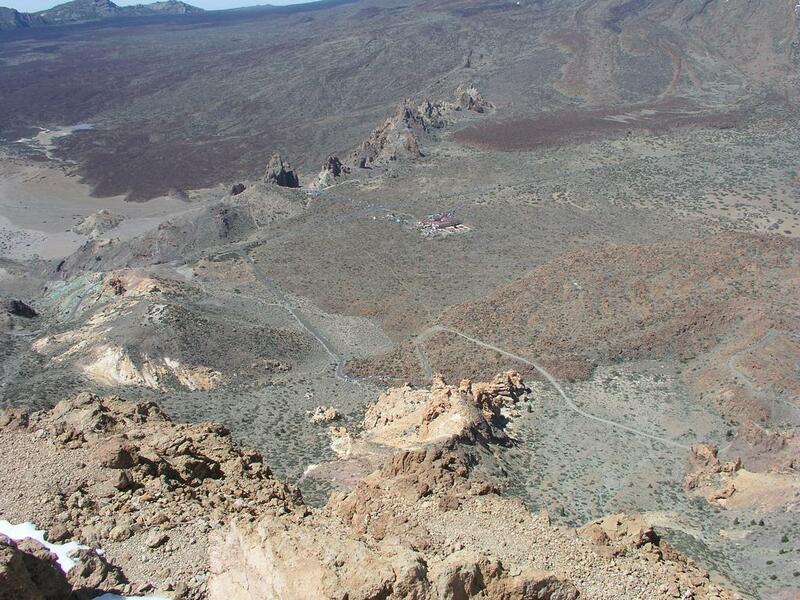 View from the summit, the trailhead with parking, the Parador Visitor Center and the famous rock formations Roques de Garcia.